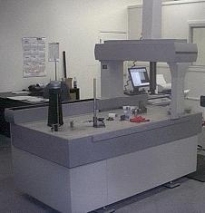 Gibbs Cam 2012 graphic CNC programming system with production turning and milling software with Post HASTE. CAD-Key system with translators for IGES, DFX and all other popular formats. 1 Brown & Sharp inside micrometer set 1.60" - 4.00"
1 Brown & Sharp inside micrometer set 0" - 12.00"
1 Set Starrett inside micrometer 0" - 6"
1 HELMEL Microstar Model 530-202 Manual, Measure Ready Coordinate Measuring Machine with GEOMET 3D measuring software. Travel X=30", Y=50" x 20". 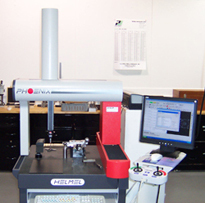 Resolution .00002", Repeatability .0001"
1 HELMEL Phoenix Model 216-142 DCC, Cordinate Measuring Machine with GEOMET 3D, MCR20 Stylus Change Rack. In addition, we have numerous items not listed here, but are necessary to perform comprehensive quality studies. All equipment meets the National Bureau of Standards certification. Certified to MIL-1-45208A and MIL-STD-45662.